Google Now offers an excellent weather card with great design and a cute, happy little frog. Now it delivers even better data, with new graphs that illustrate the wind and precipitation forecast for upcoming hours and days. Once the wind hits the 12 mph mark, the color changes to green so it’s more easily distinguishable from the the other bars. Get a better picture of the wind and possible rain in your weather forecast. The precipitation chart offers more details and uses a new illustration scheme to make it more clear whether you should expect rain or snow. This update is rolling out on Google’s end, so you may have to wait for it to show up. If you haven’t tried out the weather experience, type out “weather” into the Google search bar or use a voice command. You then pin a shortcut to your homescreen that will launch this directly. 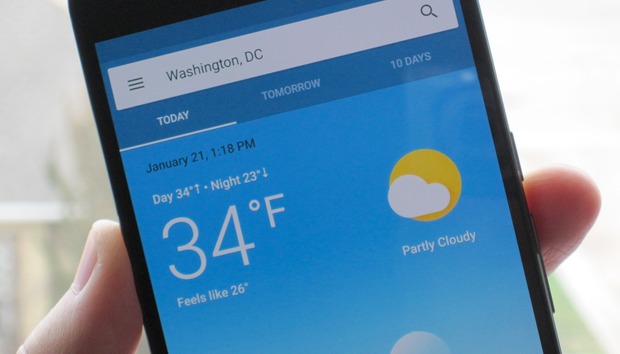 The impact on you: There are plenty of good weather apps for Android, but it’s hard to go wrong with what Google has built. It’s another area where a quick voice search can pull up the information you need without the need to hop into another app just to find out tomorrow’s forecast. Now if only Google would make a good widget (with clock) for this excellent weather tool!